Would you like to learn to give intuitive readings that can change peoples’ lives for the better? Was I born knowing how to do all of these sessions? No, I learned them! 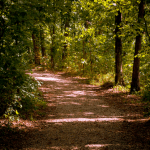 …by taking courses, reading books and getting one on one mentoring with healers and psychics. 3. I feel confident to tune in and get an answer to pretty much anything a client can throw at me, including specific information on careers, relationships, other people, life purpose, etc. After seven years in practice, I am now offering to teach others my unique system for working with clients. 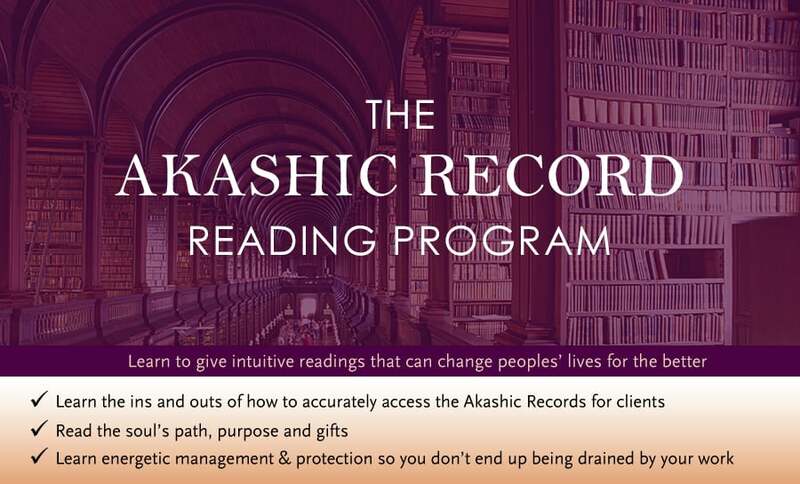 Introducing my Akashic Record Program. It’s a home-study course that you access online. It comes with a private mentoring session, an online forum for extra support, a 209-page PDF manual, 9 hours of audio on mp3s and a workbook. Plus a bonus healing session. The Akashic Records are an incredible source of information about a client’s soul gifts, history and personality. 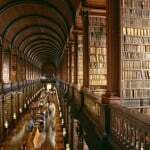 (Clients are constantly amazed by what you can pick up about them when you can read their Akashic Record…) However, the Akashic Records also contains a huge amount of information, so knowing how to navigate the records and only retrieving the information you need is essential, otherwise you can get lost in useless information. Learn about the two ‘barriers to accuracy’ which can prevent us from receiving accurate information in the Akashic records and in other kinds of reading too. By reading the Akashic Records, you can access the deepest level of information about a person and read their soul contract. Being able to consciously read and access this information is a real advantage. I consider it to be an essential skill for all professional intuitives. That is why I have started by teaching how to read the Akashic Records. Receive extremely detailed information about the soul groups of origination (there are 22 of them.) I believe that this soul group information is the most detailed information available at this time. This information goes a long way to explain a person’s character, values and soul urges. And you can do it all accurately and systematically. The material is presented in a very logical, step by step manner and it’s a system that anyone can use, regardless of your gifts. Your primary life lesson for this lifetime – this is often interesting and validating because you choose experiences which allow you to learn this primary life lesson, so you can find out why you choose the experiences you do and how they fit into your soul’s path. And of course learning is a big part of everyone’s life purpose. We can also look into secondary life lessons. The periods in history and spiritual/religious paths that have played a large part in the story of your soul during past incarnations here on Earth. If necessary, we can also find out more detailed information on past lives. For more details on the above aspects and what an Akashic Record reading looks like in practice, please see this article: Anatomy of an Akashic Record Reading So as you can see from this description, when you read for a person, you will be able to tell them what their soul gifts are (and specific ones too), including which energies they bring strongly into the physical, and which parts of their personality come from their soul’s nature. This part of the reading is great, because you can tell someone exactly what they’re like (without knowing anything about them apart from their place of birth and date of birth) and then tie their characteristics back to certain parts of who they are on the soul level. AND explain WHY they are as they are, on the soul level – I.e. what has shaped them into who they are today. There is a reason for each characteristic and gift you have. It’s all in your past and this course can uncover the secrets of why. This reading can touch peoples’ souls and awaken parts of their being that they had forgotten. If you are an intuitive who already gives readings, you can add an extra dimension to your readings with this knowledge. If you’re not yet a professional intuitive, it is the first thing you should learn. Is Robyn exaggerating when she says ‘astounding’? How exactly professional psychics and healers accidentally take on energies from their clients which can gradually drag them down over time, and even cause them to go back to the work that they used to do, simply because it was less exhausting. Learn about the one source that you should NOT ever be channelling (that many untrained psychics do) – and how you can make sure you do not channel this source on behalf of your clients. As part of this bonus module, you’ll get a half hour session with me for removing a really common form of energetic ‘clutter’ that you can pick up from other people, especially if you’re an empath. This kind of clutter can affect your accuracy as an intuitive and your energy levels. We will remove any of this that we find in your aura and your home, before you even start the course, leaving you feeling clearer and lighter. So that this session is not just a ‘band-aid’, I will also pass on a technique which can help to protect you from taking on this kind of energetic garbage in the future while working with clients. This module also includes: how to remove any lost spirits from your home and space (and your aura!) – how to easily and lovingly heal these spirits so that they can move on to their next right place of expression. Keeping your space free of energetic clutter and spirits that you don’t want to be channelling. This is a fantastic lifelong skill set to have if you are someone who notices the presence of random spirits. I use it whenever I go to stay in a hotel or anywhere where the energy isn’t particularly nice. That can be changed in minutes. It’s also an essential skill to have if you are going to be doing readings for others, since you don’t want to be channelling random spirits – you want to be channelling spirit guides, and getting information directly from the Akashic records. My aim is for you to feel balanced, grounded and have lots of energy while going through this course and when working with clients. 1. I sometimes doubt my intuition – do you think this course can work for me? 2. Is this professional course OK for complete beginners? Yes. This course can work for you even if you are a complete beginner. 3. Should I do the Intuitive Awakening course for beginners before I do the professional course? A-ha moments will abound. You’ll learn how the soul really impacts who we are and the meaning behind events that we go through. Having this information has brought me a new level of understanding and peace as a person. Plus, the information included in this chapter can accelerate your spiritual awareness and growth in a big way. It can also give your practice a head-start (maybe 5-10 years) I have no idea how long it would have taken me to work out the information in this chapter without being taught it. It would have taken years of working with people. You receive unlimited support* as you work through the course. We have a half hour session of one-on-one mentoring together. You get to listen to me giving a reading to a real client. You will do your own practice readings. You have access to the forums so you can stay in contact, ask me questions and share your experiences with other students. *Please note: Anna will be available to answer your questions in the online forum for 12 months following your purchase. You can start giving Akashic Record readings as soon as you are certified. You don’t have to move on to The Intuitive Reading Program, but if you choose to, The Intuitive Reading Program can teach you how to give other kinds of readings, as well. A chance to practise and build your confidence with unpaid readings with practice clients. There is a strong practical aspect to this course. Indeed, the practice readings will form the basis for our mentoring. There is so much information in this course that you will need more than a weekend workshop or even a week long workshop to integrate it all. You will have the chance to work with a mentor over time, and ask any questions that come up over a few or several months, rather than just having access to your teacher during a weekend or 7 day workshop. If you choose to pay in four instalments, you will immediately receive access to the first quarter of the course digitally, and another quarter each month. Please note: I recommend that you download all files for this course onto your computer. We aren’t able to offer tech support for downloading to your phone or tablet if you encounter any issues – only for computers. It is also possible to get a printed copy of the manual and the course CD’s sent to you for an additional $79 (US). This can be ordered in the members area once you enroll. This course works as a standalone course for reading the Akashic Records. You don’t have to move on to the The Intuitive Reading Program if you do not wish to. For more details on the Intuitive Reading Program, please go here. CHECK OUT RECENT GRADUATES OF THE AKASHIC RECORD READING PROGRAM BY VISITING THIS PAGE.